Whether you're starting a new business or trying to move your current organization or practice to the next level, developing a plan to identify, attract, and retain new clients is a key activity. Who are the best targets? How shall we let them know what we've got to offer? How often should we stay in touch? 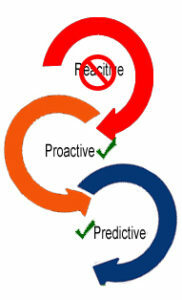 When does our business development effort cross the line and start to turn-off those we're trying to win over? Even more concerning, though critically important to most organizations, business development is frequently a reactive or procrastinated activity, thus yielding sub-optimum results. We can help jump-start your new business development effort, starting today! In many cases, modifications to communication style and planning techniques can significantly transform the effectiveness of business development, social networking and prospecting activities. 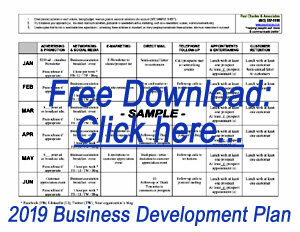 Download this annualized business development plan, a free resource that will help you allocate time and resources as necessary. More importantly, the plan will help you identify the action steps necessary to achieve your overall business development goals. We can help you eliminate the guess-work by sharing a proactive, predictive approach to business development and practice growth. Our research and experience working with professional service providers of all types have consistently uncovered a trend toward being reactive when it comes to practice growth or business development in general. This is no surprise, especially when recognizing the honest fact that the knowledge and skills possessed by most professionals are far-afield from the world of selling. As is true with most things in life, it is difficult to commit to a consistent regimen without knowledge of and confidence in the process-at-hand. Yet without a steady, predictable source of new business, and without a growth plan that goes beyond being ad-hoc, your practice and future well-being are at risk! Please contact us to discuss the possibilities.